The Camp Fire, which crushed the lives and livelihoods of the 30,000 residents of the town of Paradise, California, was not just a natural disaster. It was a social tragedy rooted in inequality and injustice. The Camp Fire is but another example in a long string of disasters that supposedly is inflicted upon us by the “nature” of things. That is how the media interpreted the 2007–2008 financial crisis: as “the cost of doing business,” with the vast majority of bailout dollars going to corporations and/or to the very culprits of the crash. It is also how the media continuously construct the “criminal” system: as a social effort “saving” us from “criminals” and the “epidemic” of “crime” (instead of what it really is, i.e., evidence of a targeting practice from a culture awash in white supremacy and class warfare, a massive denial of the ubiquity of “crime,” and one of the planet’s most iniquitous, unlawful, and disturbing collection of institutions and practices). 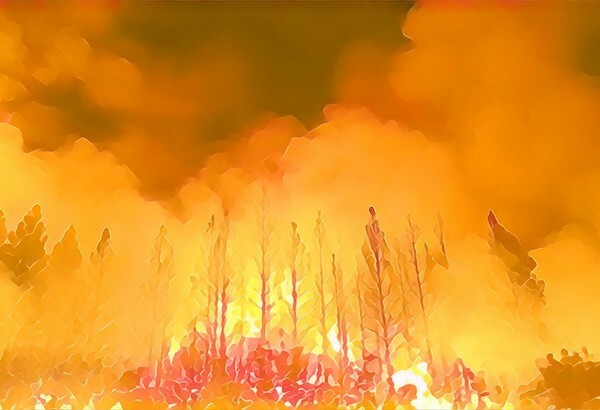 The commercial media generally portrayed the burning of Paradise as a disaster brought on by uncontrollable Nature, or at best, as the consequences of global warming wrought on us all.1 If one does not look closely, what took place in Paradise gets lost in a rhetoric that literally reshapes what happened. Repeatedly classified in media outlets as the deadliest wildfire in recorded California history, or as a new kind of climate-change wildfire, the Camp Fire has become the foundation of a narrative that deeply buries the truth. Emergencies tell us a great deal about how life is valued. We learned a lot about how the federal government values communities of color, the poor, and our captives (prisoners) in the stories of Katrina and Maria. Paradise, a town of mostly small, humble houses and numerous mobile homes and trailer parks, was a place whose residents belonged squarely in the middle- and lower-income brackets. For the nearby university town of Chico, Paradise served as a reservoir of blue-collar workers and laborers. For retirees, it was an inexpensive place to make a home, an escape from the absurd price of California real estate. The popular narrative of the fire focused on “the normal fire-scape of California,” “the results of people living in a fire-prone area,” or what the Governor called “the new abnormal of fires.” But where was the barren ring-of-land protection for Paradise? Where was the prescribed burn around the town of Paradise—which was what saved the neighboring city of Chico from this same fire? One cannot help but remember the well-known inadequate protection of the New Orleans’ levee system that in Katrina left many neighborhoods of color and poor neighborhoods below water. How could a town like Paradise, known to be extremely vulnerable to fire, and especially vulnerable to a fire that would move with extreme speed as the Camp Fire did, be left without protection? Why did only a fraction of the residents receive alerts or an order to evacuate? Why was the decision reached not to use an Amber Alert communication, a message that would have gone to every cell phone in the area? As one resident said, “They totally dropped the ball on this. Look, all these people dead, all these people missing. It’s like they decided to forget about us. Like we weren’t worth saving” (Romero et. al 2018). As one local wrote, “What emerges, too, is a troubling sign of working- and middle-class challenges compounded by disaster: people on Social Security or disability, people with no insurance, people with nowhere else to go. In this increasingly expensive swath of California, Paradise was one of the last places where you could live on a fixed income. Hospitals, rehab centers, convalescent homes and community pharmacies dotted its main roads. Less than two months ago, the local county declared a shelter crisis” (Pape 2018). The questions linger. Almost half of the dead from the fire are 65 or older. What does this say about how we value the elderly? How could a state main power provider, PG&E, which has already been blamed in a California Department of Forestry and Fire Protection report for being the cause of a number of previous fires, be allowed to operate dangerous electric power transmission lines that are currently the favored cause of the Camp Fire? Why are these wires, well known as an extreme fire danger when near forests, not mandated to be buried in the ground? What does this indicate about how a society decides when the interests of a corporation and its most vulnerable populations collide? What does this say about the lack of protections in place from the unhinged corporate greed and unimaginable disregard for human life and the environment from corporations such as PG&E—one that has been documented as an extreme abuser and the subject of a Julia Roberts’ Hollywood blockbuster, Erin Brockovich? When a town narrows the limited paths for emergency exits for the sake of commerce, despite warnings to widen them in a Butte County grand jury report after a 2008 fire, what does this say about the battle of humans vs. dollars? The aftermath of the fire has exacerbated the problems of the former residents of Paradise. The first wave of evacuees took refuge in a large field adjacent to and owned by a Chico Walmart store. I was shocked by how much hostility was directed at fire refugees and how they were portrayed as potentially dangerous. In an effort to supposedly protect consumers from witnessing the unpleasantness of people in the midst of total loss, pain, and despair, Walmart hired a Texas private security firm, staffed by massive musclemen clad in intimidating military-style outfits and carrying weapons. Unbelievably, Walmart quickly erected a fence around the field and removed the refugee campers. Many of these campers, having lost vehicles and homes, had only local jobs available and needed to stay nearby to get to them; or they wanted to stay close to nearby families and did not want to move to the more distant Red Cross facilities at State Fairground spaces in neighboring counties. In addition, by displacing people in need to distant housing shelters, local activists, who were visiting, comforting, bringing supplies, and feeding people in the Walmart field and other locations, were shut out. The Camp Fire is already becoming old news. Media accounts prefer new disasters, not reflections on events already maxed out on “empathy exhaustion.” A friend and I started a foundation that connected Bay Area food and beverage companies with local shelters needing food; initially much was given, but for weeks now we cannot even get a response from these providers. Starting very recently, residents have been allowed to return to the almost entirely burned-to-the-ground town of Paradise. A friend working in Chico as a nurse is deeply concerned about the health risks from simply staying and breathing in a town that needs years to clean up the profound toxicity of the earth, the frequently poisonous remains of homes and businesses, and even the harmful air. But who is going to make a fuss? Where are the practices that we have in place to worry about these lives? Where are the social justice institutions we have built, entrenched, and continuously funded to protect such lives? As the man from Paradise said, who is going to think these lives are worth saving? 1. Although Paradise suffered the largest loss of lives and homes, the Camp Fire also caused great losses in the communities of Magalia, Concow, Yankee Hill, and Centerville. Gee, Alastair and Dani Anguiano. 2018. “Last day in Paradise: The Untold Story of How a Fire Swallowed a Town.” The Guardian, December 20. Pape, Sarah. 2018. “When Paradise is on Fire.” The New York Times, November 13. Romero, Simon, Tim Arango, and Thomas Fuller. 2018. “A Frantic Call, a Neighbor’s Knock, but Few Official Alerts as Wildfire Closed In.” The New York Times, November 21. * Michael J. Coyle, Ph.D., is Professor in the Department of Political Science and Criminal Justice at California State University, Chico, and works to highlight the social construction of discarded persons—the excluded, the homeless, those targeted as deviant, the imprisoned—as “unlike us,” “dangerous,” or “punishment-worthy.” He is the author of Talking Criminal Justice: Language and the Just Society and co-editor of the forthcoming International Handbook of Penal Abolitionism. Thank you for this truth-telling read of the normalization of disaster that surrounds us everyday, burying human tragedy as quickly as we bury plastic in a landfill. Change here is going to require massive sustained energy in the face of a recalcitrant press and an constantly bombarded, sensory-exhausted public. Ripe for social autopsy, I hope that the social facts here will be disseminated in big time documentary, book, and movie formats. That seems like the opportunity here for publicizing these issues and making change happen. Dr. Michael Coyle is exactly right here. If PG&E is deemed responsible (as they most certainly are. Any panel of judges, juries and those who live in the area would easily attest to this because of the overwhelming documented and verifiable evidence) then it should not matter if people are not insured. Analogy: PG&E is the drunk driver on the road taking out innocent civilian pedestrians in an unregistered and unsafe vehicle. If they were a person then they would be held directly responsible for the entirety of their misdeeds. If corporations are now people, as Citizens United pretends, then it is time for accountability here as well. We should lock the PG&E administration up and throw away the key. It becomes quite visible that the situation, in its cumulative form, is a form of structural violence set up to favor one of the worst and most irresponsible corporations in the world. How is there is no protection here? PG&E should become bankrupt just as they are morally bankrupt already. The policing of the situation by satanic security forces, hired by a similar unsavory corporation (Wal Mart), who does not even take care of their own employees, is also quite predictable in this post Citizens United world. This would also be attested by activists and those caught directly in a humanitarian crisis. What we see through this legislation (passed on by the highest court in the land) is not the unification of citizens as the name implies, it is the disbandment and cruel structural abuse of them. It is also direct evidence that Wal Mart does not even remotely care about the communities they continuously exploit with low wages and no health insurance in the name of neo-liberal and capitalist values. Corporations against their competition, or the possibility of losing their bottom-line, divide and conquer communities of people regardless of any context, as evidenced here in Butte County. It is not unlike what is happening at our own border, or in places like Israel, or any regions that are subject to the strong arm of private and public police forces who have removed any sense of humanity from situations that demand immediate compassion and institutional reflexivity. It is very sad for me to see this happening to people that I have been neighbors with for 20 years. They deserve much better and we all must do more than just hope that social justice and proper compensation come their way. Great piece, Prof. Coyle. The portrayal of the Paradise tragedy as a “natural” disaster belies the real cause: neoliberal failure. A lack of government funding lies at the root of the disaster in a number of ways, two of which include: (a) no adequate fire breaks around the town (as you point out); and (b) the fact that plans for a more-efficient, higher-capacity escape road were scrapped due to lack of public funding. Neoliberalism once again fails the poor and working class.